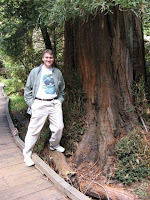 Last weekend Ryan and I spent a couple of days in San Fran for the American Academy of Dermatology Conference. He goes most every year (last year I was in the hospital having Paisley so we missed it) to shake hands and bring in some new clients for his practice. 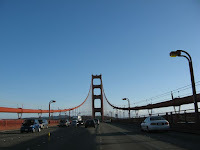 We were able to squeeze in a visit to Muir Woods, just over the Golden Gate Bridge, and Stinson Beach, a trolley ride to Fisherman's Wharf and Ghirardelli Square with a view of Lombard Street in passing, and dinner and shopping for trinkets for the girls in Chinatown. It was fun to be in a big city again--I love the vibrancy and the culture that comes with a real city. But I'm always happy that I'm living in a bit more sheltered town here in Boise. I helped out in Ryan's booth on the tradeshow floor, where it is always interesting to people watch. Walking along the streets of San Fran we noticed a few scraggly men shaking their cups and asking for donations-some playing music, others just hoping people would drop in some change. We mused that our activities in town weren't all that different, we just have a nicer backdrop. Maybe next year we'll bring along the violin and just have the case open in front of our booth, "Biopsies to spare, anyone?" The girls were well taken care of here at home, and it was nice to have a couple of days break, even though we were working. Sounds like fun! Thanks for sharing and keeping us updated.